Damage: An Inventory. 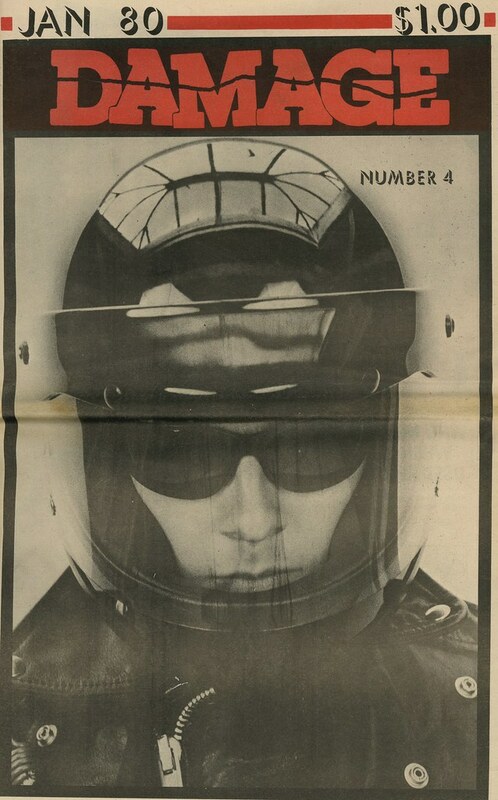 Issue number 4, January 1980. A pronounced regionalism prevailed in the American underground music scene of the late 1970s and early 1980s. In California, the micro-climates of Los Angeles and San Francisco each nurtured a distinctive local take on punk rock. Local fanzines reflected this, with publications like Search & Destroy celebrating the eclecticism of the Bay Area while Slash Magazine spoke to the angular defiance of Melrose and Silverlake. 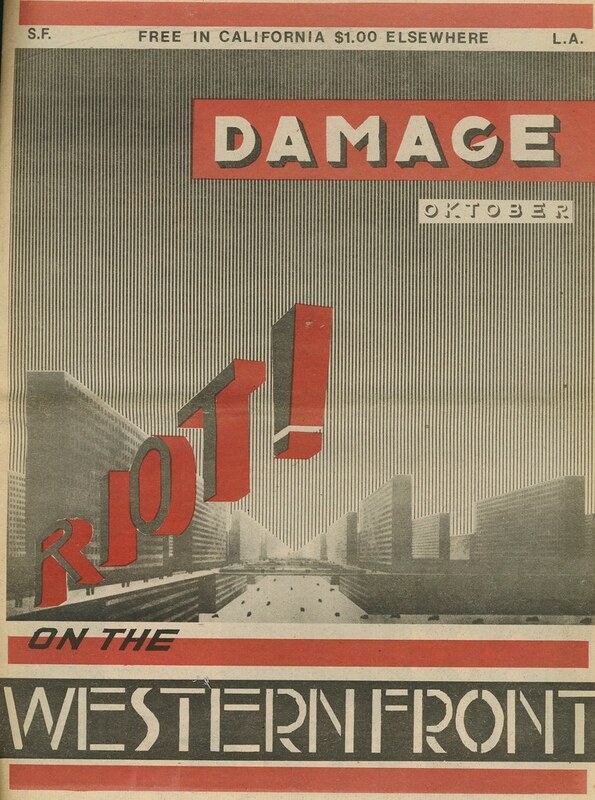 Brad Lapin’s Damage: An Inventory represented itself as a partisan of both communities, and furthermore, sought to connect West Coast punk to developments in Tokyo, Paris, London and elsewhere. 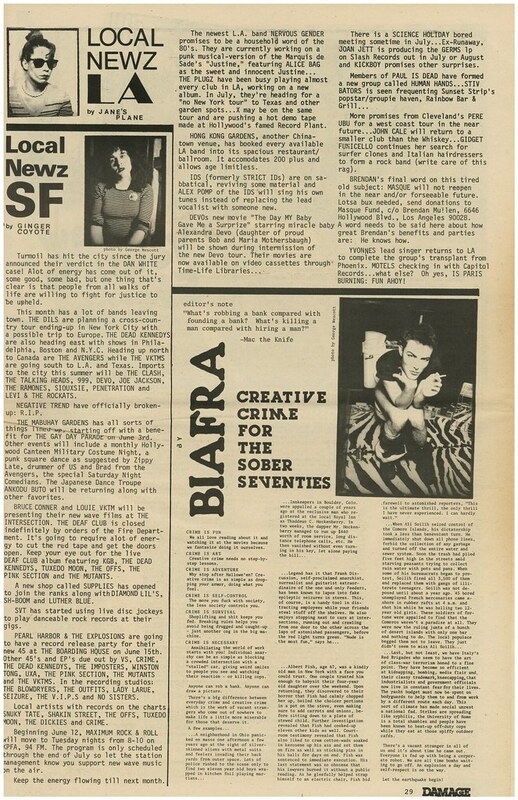 The interest in other scenes was not in itself unusual for a punk fanzine, but Damage‘s coverage of the movement’s regional and cosmopolitan outposts was remarkable for a publication of its scope. Issues regularly featured in-depth reports on developments in Japan, England and continental Europe, promoting a sense of connectedness to the global underground among its readers. 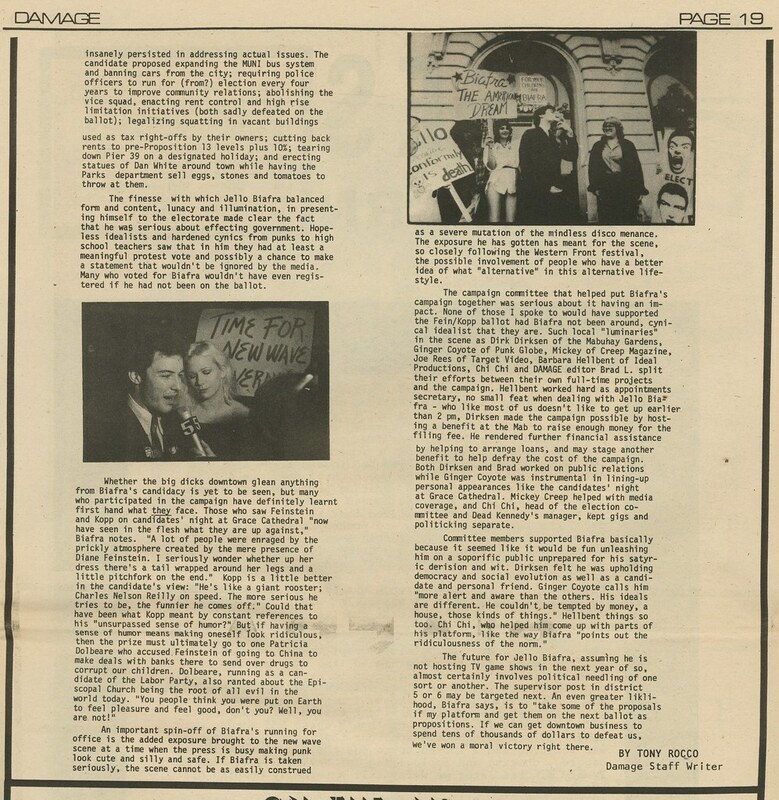 "Local Newz LA / Local Newz SF"
The Western Front Festivals of 1979 and 1980 sought to strengthen California’s connections to global punk and new wave movements. Its 1980 presentation drew dozens of obscure and well-known bands from the region as well as acts from New York, Canada, and the U.K. for 10 days of performances, films and openings at Bay Area venues. 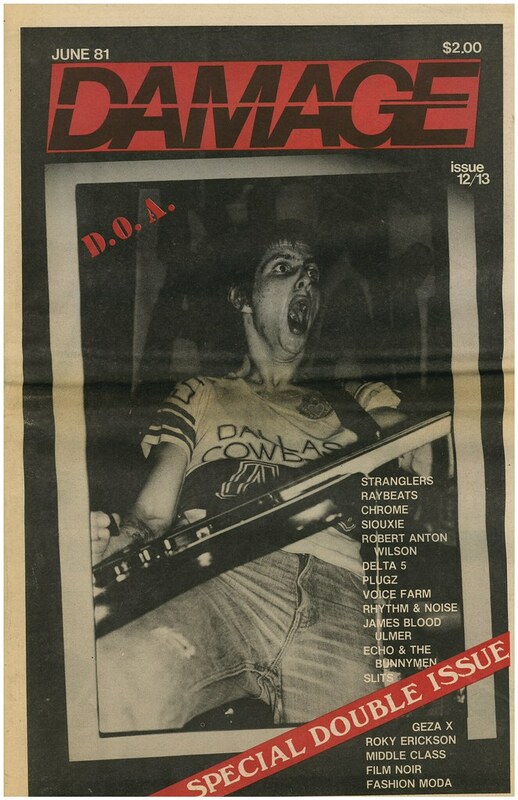 Damage co-sponsored the festivals and devoted special issues to each year’s events. "Riot on the Western Front!" The magazine and its cohort participated in cultural events well beyond the club scene. Notably, during the 1980 election cycle in San Francisco, Jello Biafra (lead singer of the Dead Kennedys) registered as a candidate and actively ran for Mayor of San Francisco. Lapin, Coyote, and staff writer Tony Rocco took part in the effort to promote his candidacy as a popular media spectacle and satire of corrupt local politics. 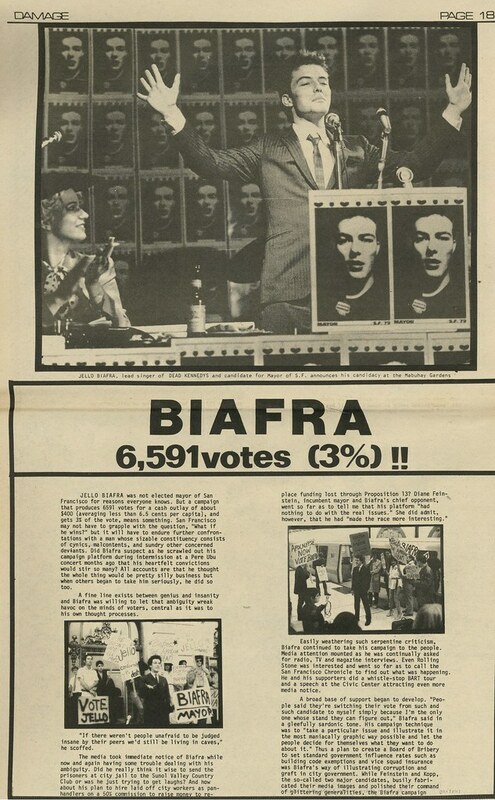 Biafra 6591 Votes (3%) !! "Time for New Wave Government!" You can read his entire statement here, on Mondo X, The Brad Lapin Weblog. Damage, issue nos. 12/13 (final double issue), cover detail. F.A. Bernett is pleased to offer a scarce complete set of Damage in generally excellent condition. Please contact us regarding price & availability. FAB Item I.D. # 46316. Bill DiMichele, I would like to contact you. Please email me at rond108@yahoo.com. Thanks! hop i can buy damaged mags here. thanks. moved to s.f. in 1980 but only caught some damaged mags. i’d like to buy a bunch of them if possible. thanks. Next post: “Everything has its Limit! Even Miniskirts…” Aerial propaganda leaflets on the inner German border, 1965-1969.